It was only a matter of time until new apps would be called or (in this case) boldly pitched by their own developers as “Instagram for video.” Such apps are coming out of the App Store woodwork, and the latest is Viddy. Instagram, if you remember, is the stylish, photo-centric offspring of Twitter and Flickr. You and your friends can snap photos, apply your choice of trendy filters, and share your creations on both Instagram’s own network and any other social outlets you choose to plug in. Instagram quickly rose to popularity for its polished, frictionless experience and ability to make typical photographs of a hipster’s lunch or a sunset look slightly more novel than they probably are. Viddy really does seem to have been heavily inspired by Instagram when building its namesake iPhone app. You can shoot a video, apply any number of “cinematic production packs” (also known as filters or effects) to stylize the footage, and share your creation out to Facebook, Twitter, and YouTube, all with an interface that will probably make most Instragram users do a double-take. But instead of just being a basic video camera app with some social tendencies, Viddy, like Instagram, is also its own social network. You can follow friends and view an activity stream comprised of nothing but their videos, as well as view popular and trending sections with videos from across the network. Viddy isn’t the first app to make a land grab for the super-simple-social-network-for-video that is entirely run on mobile devices. (Again, like Instagram, you can’t even sign up for Viddy on a traditional computer; you get started and perform all interaction on your iPhone or iPod touch). Socialcam is also attempting to climb the App Store’s ladder in this space, albeit with an interface and feature set that is at least somewhat unique. Viddy does look interesting, though, from a “fresh start in the mobile space” perspective. This is by no means an official Macworld review, but Viddy’s experience looks polished and you get some nice control over certain aspects, such as how heavily a video effect is applied and whether you mix an audio soundtrack on top of whatever audio you record with your video. Plus, plenty of Instagram users have lamented the fact that it avoids video of any kind, so there certainly seems to be room for a streamlined, Twitter-like network focused only on sharing video. Eventually, Viddy plans to expand to the iPad, Android, and other platforms, and it’ll add in-app purchase features like premium production packs. For now, though, you don’t have anything to lose but a little bit of time. 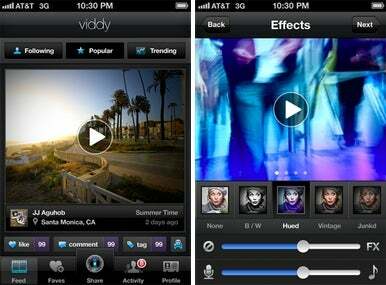 Viddy is available for free, and your iPhone or iPod touch will need to be running iOS 4.1 or later.